This is the capital city for the Dwarven and Gnomish races, and it located in northern-dentral Dun Morogh. You can access it via a path north of Kharanos. The path leaves the main path and goes east up into the mountains. The Deeprun Tram connects Stormwind and Ironforge, allowing direct travel between the two cities without cost or risk of attack by NPC creeps. The heart of the alliance AKA Grand Central Station. Become one of Greatfather Winter's helpers. All you have to do is go just outside of the city of Ironforge (just to the left if your coming out, and on the right if your going in) and step into the machine and you will instantly be transformed into a green or red gnome!! Merry Christmas everyone!! Snug within the wintry peaks of Dun Morogh, Ironforge is the proud home city of the gnomes and dwarves of the Grand Alliance. Defiantly braced against the northern reaches of Khaz Modan, the dwarf-carved walls of Ironforge represent the principal bastion of the civilized races against the ravages of the undead Forsaken and their Horde allies throughout Lordaeron. Ironforge enjoys the wise leadership of King Magni Bronzebeard, a old and noble dwarf, if one grown sullen with how fate has treated his family. Stories of the three Bronzebeard brothers have long been told in all of Azeroth, but when Muradin Bronzebeard was slain by the traitor Arthas shortly before the fall of Lordaeron and the explorer Brann Bronzebeard disappeared in Northrend while investigating Muradin's death some time later, many fear that Magni's death will mean the end of the Bronzebeard dynasty. Gnomes, cousins of the dwarves, fled their ancestral home of Gnomeregan when stopgap measures to thwart a recent trogg invasion with toxic gas led to the tragic deaths of 4 out of 5 gnomes. They now rebuild their proud, technologically-saavy race within the protections of Dun Morogh and Ironforge. Ironforge serves as a major travel hub for all Alliance flight masters spread throughout Lordaeron, and offers a speedy connection to the human city of Stormwind via the Deeprun Tram. A boat to Northern Kalimdor and the Night Elf home of Darnassus is only a quick flight to Menelethil Harbor away. Additionally, many high-end groups form in Ironforge due to its close proximity to many level 50-60 instances. Being the first Alliance city to offer an Auction House, many Alliance's player-market transactions occur in Stormwind out of habit..
As a Dwarf or Gnome - Ironforge is a just a quick trip to the north central part of Dun Morogh. Check your map and follow the paths, and you should find Ironforge without difficulty. As a Human - The quickest, safest way to reach Ironforge is to catch the Deeprun Tram in Stormwind (the human city of Stormwind is found in northeast Elwynn Forest, and the gearlike archway of the Tram station is found in the northernmost part of Stormwind). All aboard, and you'll soon arrive in Ironforge's "Tinker Town" area. As a Night Elf - The trip to Ironforge from Darnassus is a long, arduous journey, and should only be attempted by explorers in their mid-teen levels or higher. First, go through the Darnassus portal to the coastline and catch a hippogriff or boat to Auberdine. When you arrive, check with the harbormaster at the docks to determine from which dock the boat to Menelethil Harbor departs from. There might be a small wait, but climb aboard when the correct boat arrives. When the boat docks in Menelethil Harbor, check in with the Flight Master and follow the path east northeast out of town. Stick to the paths through the wetlands and keep a sharp eye; there's plenty of monsters around to devour an unsuspecting low-leveler. Go straight when you come to the "T" and follow the path as it winds around to the south. You'll climb through a series of tunnels and mountain passes as you enter Dun Morogh. Continue on the path south and make a right (go west) when you come to a fork in the road. It's north at the next "T" and then you should see the gates of Ironforge proudly rising off to your right. This is the main city of Dwarf/gnomes! The entrance is at 53,33. Ironforge, the capital city of Dwarfs and Gnomes, Ironforge is a big place but watch out for lava and fire, also theres a tram that takes you to "Stormwind City" Capital City of Humans. Yeah and i there is a "Old Ironforge" but its hard to get to it i wonder why the blizz made it, i think its because they messed up with crafting the first Ironforge meh i dont think so but i been to "Old Ironforge" no bodies in it and its a small place. The object for which Ironforge is named, the Iron Forge, an ancient Titan artifact. Old Ironforge exists in game, but it is not accessible through normal means, and as a closed area, contains no NPCs, items, or other such content. In the High Seat area of Ironforge, there is a hidden door behind Deliana. This hidden door leads to a long hallway descending to the underground chamber of Old Ironforge. Old Ironforge consists of a large column of stone in a pool of lava. At the top is a carpeted platform, and a path winds down around the column to two closed doors. The ceiling features large purple crystal formations. There are several ways of getting into Old Ironforge that were known to work in the past. Blizzard periodically implements workarounds to prevent access to closed zones, so now some of them may have been fixed. The first is to start a duel with a mage behind the pole outside of the bank in Ironforge. QUICKLY run into the back of the king's room (it is close enough to where the original duel started, so the duel will not cancel). Run up next to the door and have the mage sheep you. If all goes well, you will wander under the door and the sheep will break. If not, try it again. This is an alternative to the first way. You'll also need a mage friend. Starting facing the bank in Ironforge, take the passageway to the right so it goes to the Great Forge. Find the second corner on your left after you exit the passageway. The corner should look like a direct right angle on the map. To make sure you have the right corner, look on the map and imagine it as an arrow. The arrow should be facing north-west. If your there, jump and press forward against it. Eventually you'll get the hang of it and keep jumping up until your head reaches the ceiling, or a tad bit close to it. The mage must get there too. Then start a duel with a mage, and run up next to the door and have the mage sheep you. Repeat until you wander under the door and the sheep breaks on the other side. I'm sure you heard about "Old ironforge" and stuff like that Here's a movie that will explain how to get there!. The great city of dwarves and gnomes, Ironforge is the main Alliance city in northern Eastern Kingdoms. It is located in Dun Morogh and is connected to Stormwind via Deeprun Tram. An inclosed area some refer to as Old Ironforge is accessable from here through certain glitches. The Commons is a trading area, holding the Auction House, bank, inn, mailboxes, and many shops. This is what you enter after the Gates of Ironforge. Heading deeper into the city, take one of the paths into The Great Forge, a giant lava pit surrounded by shops and trainers. In the center of this area there is a bridge with 'The Great Anvil', other anvils, forges, and other things related to blacksmithing. (including Bengus Deepforge, the Expert Blacksmith) This also includes the Gryphon Master. Other important landmarks in this city are the Battleground Masters in the Military Ward, The Deeprun Tram in Tinker Town, the Forlorn Cavern, the Mystic Ward, and the Hall of Explorers. ENTRANCE TO OLD IRONFORGE:"One experience you don't want to miss." It is very complex and hard but you must be able to duel find a place I know where but to hard to explain :/ you need (MAGEorWARLOCK that can Sheep or fear you by a wall the works and you can get in! There is a secret passageway in Magni's chamber leading to old Ironforge, but it is block by a big old gate so you cant go in. It is possible to reach the valley east of Ironforge which you fly over with the Gryphon. Although it isn't allowed by the GM's because it's supposed to be an enviromental valley only. It is possible to reach this spot with Gnomes and Draenei, but not with Dwarves (as far as I've tested). This map gives a quick impression of the route, I will post a movie on YouTube and link it here asap. There is a way, but this is illegal and you will get caught and punished by the GM's for it. Rumor has it, there is an Old Ironforge right under the new one. Don't belive me there is a youtube video World of Warcraft GM Power ExpertGamers. Is there any mob you can farm for IF rep? Another option currently exists if you'd just like to see what Old Ironforge looks like. You'll need a hunter with Eyes of the Beast. This technique is quite tricky, and I'm not entirely sure I understand what happens to make it work. Anyone who can successfully pull this trick off and explain it would surely be appreciated. As you walk into the room with King Bronzebeard, you'll notice a very large door with a lock on it to your left. You will need to make sure your pet is set to follow and be ready to press stay. Run up to the door and continue running as if you were trying to run through the door. Your pet should slip through. Immediately command your pet to stay, and then cast Eyes of the Beast. If all goes well, a little luck included, you'll have one minute to explore the area. I use King Bangalash as my pet. I don't know if other pets will work the same. In my experiences, it will take several times for this to work. Most likely, you'll get an error saying "Target not in line of sight". Do not be discouraged if you'd really like to check it out and none of the other options are available to you. It seems to work the best when you can stop your pet with the back part of the pet sticking through the door to the area where you are standing. Long ago, Ironforge, along with Orgrimmar were the only cities to have an Auction House, therefore being extremely popular among players. These places were both centers of trade for both factions. At the same time, Ironforge and Orgrimmar were infamous for the lag caused by hundreds of players around the Auction House. Ironforge was often called Lagforge ( Lagrimmar? I didn't play Horde much back then ). Then, by the player requests, more Auction Houses were added to avoid the lag and travelling from say Darnassus to Ironforge. Lagforge was no more. Still, Ironforge along with Orgrimmar seem to be the most popular Auction Houses visited. Seriously, who goes to Darnassus to visit an Auction House? Ironforge and the area it reside in, has some of the funniest and pretty easy exploit to do. The Old Ironforge which is now closed off but still accessable from glitching from mage sheep. The Gnome airport which is also accessable but takes awhile but pretty easy, to long to explain. Ironforge has that warm feeling to it and also is currently the only alliance capital that your able to duel while inside the city. Blizzard took out dueling in capitals long ago so you had to leave the city in order to duel. This stop people who used dueling to glitch or lag. But in Ironforge your still able to duel. Most common place to duel is in front of the bank across from the AH for players that are in ironforge. Nightsabre mounts for non night elves for 1 reason,the exploration achievement for 2,the beauty of the city for 3,to get quests for rep for 4,to avoid lag on a busy day for 5 any1 wanna add more? The name originates from the cheat code "iron forge" from Warcraft I. As of Wrath of the Lich King, nothing has been changed to the Old Ironforge below Ironforge. Though if you want to find some secret jumps and interesting places to explore that Blizzard forbids, try the new Stormwind Harbor. So I was reading up on catching Old Ironjaw and there was an eye catching post about the possibility of fishing from within the lava! It turned out to be much more boring then it seemed at first glance, something about standing on an invisible ledge. But it got me thinking. What would it take to survive the lava, or even thrive in it. After quickly searching the AH for any Fire resist armor or consumables, I managed to get to 294 Fire Resistance on my 72 pally. Excited to go lava swimming, I jumped sped over to the pool, but to my dismay found that my fire resistance, which the tooltip called "Very Good", only mitigated about a third of the damage, which still left more then enough dps to cut my swim very short, forcing me to bubble-hearth out after only a few minutes. Any more research into this fascinating field could prove to be immensly rewarding. This is the city of the dwarf king needed for the " for the the horde" achievement. here is a map to his location if you dont know where to find him http://www.wowhead.com/?maps=1537 major coords are 48.9, 48.1 which is his thrown room there are a total of 8 lev 75 guards 2 outside the door and 6 in the room around the edge of the roundish room. there are 2 lev 50 npc's on the platform with the king .and a lev 60 npc standing right inside the door. There 2 paths to the king one is from the front door to ironforge. this riskier of the 2 as it take you near the bank and AH. Where 90% of all ally players will be hanging out if they are in town. If you do choose this path I suggest going to the left comming out out the front door at coords 21.1, 60.5 and going down to the fountain at coords 30.3, 17.4 then turning right going on to the thrown room at coords 48.9, 48.1.. if your lucky you wont get spotted by the alliance players and the wandering mobs are few. the 2nd path is from the deep run tram coords 81.7, 51.8 this is the easier of the 2 from the attacking ironforge point of view. but requires you to go to stormwind 1st and get on the tram. doing this you might have alliance players waiting for you. The key if you take the tram is having your whole group get there at once and not waiting to enter the city proper. dont give the alliance players time to build a huge raid group to stop you. once you enter the city from the tram go RIGHT to coords 63.7 24.4 then turn left down the center of the great forge. there are 8 npcs here in the middle area ranging in lev from 30 to 60 . go past them right into the thrown room . There are no druid trainers here. If you are a druid attempting to level nearby (or in Howling Fjord), you need to fly to Stormwind. Random: Ironforge is shaped like a cog. Ironforge Guard: What do ye need directions to? Where is the Auction House? Why it's right by the gates of Ironforge as you enter our fine city. Ye'll find it just across from The Vault. The bank? Oh, ye mean The Vault! No safer place to store yer valuables than The Vault. Ye'll find it just northeast of the entrance to Ironforge. Do ye have some new treasures that ye want to keep safe n' sound? Then ye'll be wanting to store them at The Vault with the Stonemantles. Ye'll find The Vault just a hammer's throw northeast from the entrance to Ironforge. Aye, everyone wants to ride the tram, it's a real hoot and a half. Well, if ye want to find the tram, it's located over in Tinker Town just east of the gates of Ironforge. Oh, the tram, the tram... everyone wants to ride the tram. What happened to the good ol' days of flying on the back of a gryphon, gripping the saddle for dear life as you flew up high in the sky above? Bah! You go take the tram then... it's over in Tinker Town with the rest of the gnomish contraptions. Looking to take a ride on a gryphon, now are ye? Gryth Thurden is the one ye'll want to be seeing about that. Ye can find him on the eastern side of The Great Forge in the middle of Ironforge. Ah, nothing quite like a ride on a gryphon, is there? The night elves can keep those hippo's of theirs, just give me a gryphon and the wind in me hair! Well now, I won't keep ye any longer, just head over to Gryth Thurden on the east side of The Great Forge and he'll get ye on yer way. If yer thinking about forming a guild, then ye'll need to put it past Jondor Steelbrow o'er in the Ironforge Visitor's Center. Just head southeast from the gates of Ironforge to see him. Well now, ye'll need papers to form a guild, and Jondor Steelbrow can help you get started with the process. He can be found over at the Ironforge Visitor's Center when yer ready to get started. The Inn? Ah, ye looking to toss back some of the best ales Ironforge has to offer? The Stonefire Tavern is where ye'll want to go. Ye'll find it just to the left of the entrance to Ironforge if ye be coming, or to the right if ye be going. If yer of need of an Inn, The Stonefire Inn is where ye should be. Ye'll find it just to the left of the entrance to Ironforge if ye be coming, or to the right if ye be going. Oh, and if yer going that way, then tell them to have a tankard ready for me. You can find a mailbox right o'er by The Stonefire Tavern. It's just north of the gates of Ironforge. Bah! Mailboxes... all I get is junk mail lately! Increase the size of this... decrease the size of that... act now for your free Sword of Dragonslaying. I have to change my mailbox number every other month! Well, ye can't say I didn't warn ye. If you're looking for the mailbox it's just outside the Stonefire Tavern. Over in the Hall of Arms you can find our resident stable master, Ulbrek Firehand. He'll make sure any pets ye have are well fed and rightly cared for. Taking care of animals is something that Ulbrek Firehand takes quite seriously. He usually hangs out with the hunters at the Hall of Arms if ye want him to look after a pet or two. Between Bixi and Buliwyf, there ain't many weapons they haven't had the pleasure of slashing or smashing an orc with. You can find them hanging out at the Timberline Arms weapon shop if ye need some training. Yer looking to learn how to use a new weapon are ye? Well, ye should be talking to Bixi or Buliwyf over at the Timberline Arms weapon shop then lad/lass. They know their weapons from axes to... uh... zweihanders. Ye'll find the battlemasters around the war table in the Hall of Arms. You can find the barber shop on the west portion of The Commons. Which class trainer might ye be looking for? I overheard Regnus Thundergranite in the Hall of Arms bragging about a new trophy for his den the other day. If yer looking for training from a skilled hunter, Regnus is the one to see. Do ye have the potential to be a skilled hunter? Well laddie/lassie, only time will tell. Just don't ye go shooting at apples atop peoples' heads till ye've spoken with Regnus o'er in the Hall of Arms. Well ye'd be sure to find some training in the magical arts over in the Hall of Mysteries, north of the gates of Ironforge. Juli Stormkettle can always be found there with her nose in a book. That wee wizardly lass, Bink, over in the Hall of Mysteries would probably be able to help ye out with any magical needs you have. The Hall of Mysteries is just north of the gates of Ironforge. Brandur Ironhammer would be the one ye'd want to see. Ye can find him in the Hall of Mysteries north of the gates of Ironforge. Ah, good ol' Brandur Ironhammer. There's no doubt he'll provide ye with the guidance ye seek, lad/lass. Ye'll find him in the Hall of Mysteries north of the gates of Ironforge. Ah, Braenna Flintcrag. She has magic hands, that one. Braenna is the one to see about Priestly matters. Ye'll want to travel north from the gates of Ironforge to the Hall of Mysteries. That's where ye'll find her. Ah, nothing better than a priest to cure what ails ye. Of course a nice tall pint cures a lot of what ails ye too, but I don't think Braenna Flintcrag teaches brewing. I guess ye'll have to settle for some priest training over in the Hall of Mysteries instead. Now why would ye be needing the services of one of those types? We get enough trouble out of that rogue, Hulfdan Blackbeard, over in The Forlorn Cavern, do I need to be turning my eye to you as well? All the roguish types hang out in The Forlorn Cavern, north of the gates of Ironforge. I'd wager ye'll find Fenthwick there, no doubt counting the coin of another cut purse. I'll catch him one of these days! In the meantime I'll have my eye on you as well, lad/lass. Where better to look for a dark and brooding lot, than the dark section of Ironforge, aptly named The Forlorn Cavern. Thistleheart is sure to be found there, likely summoning some manner of vile creature to do his bidding. A warlock, eh... Well, if you've got a mind to be doing that sort of thing around here then ye best keep yer demons on a leash boyo/girlie. I don't like demons, but I love putting mah axe to them. Ye get me? Now you just leave me be and go get lost in The Forlorn Cavern. That's where you'll find that warlock, Thistleheart. Och! Ye seek training in the way of the warrior, do ye? Kelstrum Stonebreaker will put ye through yer paces! Just march yerself over to the Hall of Arms east of the gates of Ironforge. Kelstrum is a loudmouth and a braggart... and if that weren't enough he's also one of the most skilled warriors ye'll ever meet! I tell ye, if ye're looking to be trained in the ways of a warrior, that's who ye should be talking to. I'm sure he can be found over in the Hall of Arms east of the Gates of Ironforge. Well now, you can find Farseer Javad in the area of The Great Forge, just a bit to the North on the East side. Which profession trainer would ye be looking for? An Alchemy trainer is what you need? Well, I just came from there, I did. Ye'll find Ms. Berryfizz over in Tinker Town where the gnomes gather. Yer looking for an Alchemy trainer are ye? Just came from there, I did. Ye'll find Ms. Berryfizz over in Tinker Town where the gnomes gather. ::sigh:: ...why o' why didn't I take the blue potion. Ye've come to the right place lad/lass! People come here from all o'er the world to train to be a blacksmith. Ye'll find Bengus Deepforge hammering away at an anvil in the middle of our fine city by The Great Forge itself. Are ye really askin' me where the Blacksmith is? Have ye not heard of The Great Forge! All our best blacksmiths gather there to craft their weapons and armor! It's dead smack in the middle of Ironforge, and that's where you'll find one of our most brilliant blacksmiths, Bengus Deepforge. A Cooking trainer is it? Well then, get yerself over to the Bronze Kettle on the northeastern side of The Great Forge. Daryl Riknussun will teach ye to make a mighty fine dish that's sure to put the life back in ye! Och! That Daryl Riknussun is a brilliant cook! He makes a chilli so hot ye could temper steel with it! I don't think he'll teach ye the recipe, but he'll certainly help ye to become a good cook. Ye'll find him at the Bronze Kettle o'er on the northeastern side of The Great Forge. Ah, I believe Gimble Thistlefuzz is who ye'll be needing if yer looking to learn the Enchanter's profession. Ye'll find Gimble in his shop, Thistlefuzz Arcanery, right by the Gryphon Master at The Great Forge. Och! Ye should be careful what ye get enchanted lad/lass. I had me mug enchanted so it wouldn't spill a drop, but now I can't drink from it! Such a tragedy. You be sure to heed me advice when ye see Gimble. He'll be in his shop right by the Gryphon Master at The Great Forge. The tinkerer's craft for you is it? No doubt ye'll want to go see Springspindle Fizzlegear in Tinker Town. Just head east from the gates of Ironforge, or follow the sound of the explosions. Oh, you're looking for Springspindle Fizzlegear then. Why that little gnome and his gadgets... Let me tell you, if you're going to his shop in Tinker Town, keep your hands to yourself and don't pet any of his mechanical sheep! Exploding sheep... now why would you even make such a thing! A valuable skill First Aid is. Our resident trainer, Nissa Firestone, can show ye how it's done. Look for her on the southern side of The Great Forge at the Ironforge Physician. First Aid? Well ye don't look hurt to me. If yer really interested in learning First Aid, then Nissa Firestone is the one to learn from. Go see her over by The Great Forge in her shop, The Ironforge Physician. Grimnur Stonebrand will tell ye some whoppers about the one that got away, but he's still one o' the best fishermen around. He's got a shop set up in The Forlorn Cavern called the Traveling Fisherman. I once heard ol' Grimnur say he fished up a sword. Or was it a swordfish? Damn that Grimnur, he's told so many fish tales I can't remember which is which. Well, why don't you go see him over in The Forlorn Cavern and have him tell you what it was. Flowers and seeds and such? That would be Reyna Stonebranch's area of expertise. Ye can find her tending to her plants over at the Ironforge Physician on the southern side of The Great Forge. Oh, ye want to learn to pick some daisies do ye? Ha! I'm just teasing ye laddie/lass. A fine profession it is, and Reyna Stonebranch can show ye how it's done. She works at the Ironforge Physician on the southern side of The Great Forge. Elise Brightletter is near the Great Forge adjacent to the Flight Master. Fimble Finespindle has a shop set up on the northwest side of The Great Forge. I wager he could show ye how to make some fine armor. Sure ye don't want to be a Blacksmith? Well, if yer heart is set on Leatherworking, then you best talk to Fimble Finespindle over at his shop on the northwest side of The Great Forge. Well well! You've come to the right place to learn Mining, boyo/girlie! Geofram Bouldertoe himself resides at the Deepmountain Mining Guild. Ye couldn't ask for a better instructor than him. Do we have Mining trainers here? Where do ye think ye are! Why you'll find one o' the best miners in all Dun Morogh at the Deepmountain Mining Guild on the northern side of The Great Forge. There, Geofram Bouldertoe will show ye the true art of mining. Balthus Stoneflayer is the one to see about Skinning. If it can be skinned, he can teach ye how. Just walk yerself over to Finespindle's Leather Goods on the northern side of The Great Forge. Skinning? The only thing ye look like ye could skin is yer own knee! Ha! Now why don't you go see Balthus Stoneflayer so he can teach you how to properly skin some animals. You'll find him in Finespindle's Leather Goods on the northern side of The Great Forge. That Jormund Stonebrow has a knack for the needle, he does. Should you be needing some training, then you'll find him at Stonebrow's Clothier on the northern side of The Great Forge. Ye might not know it, but in addition to being a skilled tailor, Jormund is also a slayer of giants! Why he must have overheard a few of us sharing stories when he shouted that he'd killed seven with one blow! Ye should pay him a visit at his store on the north side of The Great Forge an' see if he'll tell ye the tale! My favorite major city cause its not so laggy , its beautiful and a cool place to chill ! Currently on the PTR 4.1 the door to Old Ironforge has been opened. There are a few Ironforge guards and an honor guard down there as well as a little updated scenery on the top platform. You still cannot mount here so if you fall in the lava you have to hearlth/port out. "I've the finest wires in the land!" I can't find a better place to put this, but - I found a way to get to Ironforge Airport, on foot. No special mounts, no flying/floating/levitating/not-falling, etc. You can get out the same way, too. I'd be happy to write it up in illustrated detail if someone might how me how/where. fun fact: in beta (you can find videos) IF was supposed to be many times the size it is now with many floors and bridges. Similar to Grim batol (but still bigger). They realised it was just too huge with travel time inside being freakishly long and changed it to its current size. Where is the horn that sounds the hour? Man, I LOVE this city. So much nostalgia! I remember getting to stormwind from kalimdor without a portal required you to take a long journey through wetlands and loch modan to Ironforge. I did this as a noob to meet up with my brother who played a human rogue, and It was amazing seeing how big the World of Warcraft was back then, avoiding high lvl mobs and the like. But when i got to Ironforge it was breathtaking and has been my favorite city to hang out in ever since. One thing that is disturbing to think about is that if Ironforge were a real city, it would probably be the deadliest one due to all the sulfurous gases and other dangerous underground chemicals clouding up in the air from the open lava everywhere, causing people to develop lung problems or just straight-up die. You would stay alive here. There is no graveyard so your spirit is released outside, at the gates. Fun fact: Ironforge was actually intended to be MUCH bigger and have different levels of the city instead of just being one ring on the same plane. 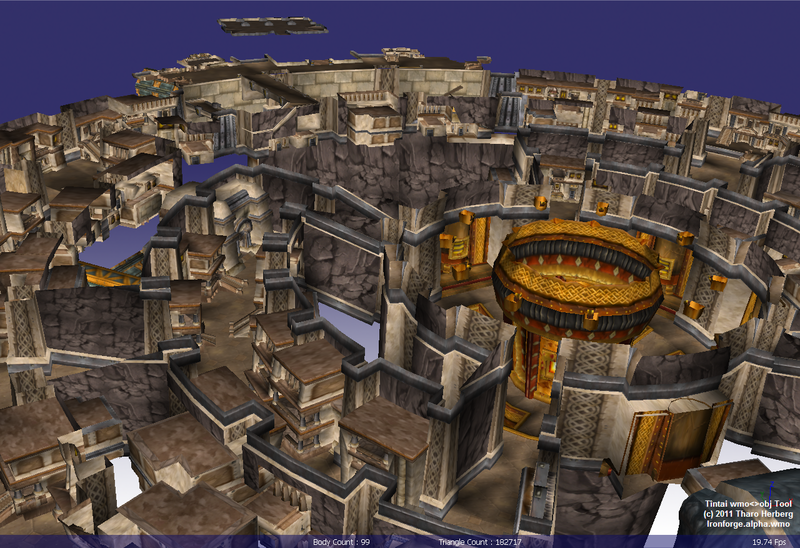 It was like this in Classic WoW's alpha, but Blizzard decided to make Ironforge what it is today because the original design was very maze-like and confusing. The original was more like a labyrinth and consisted of 3 rings instead of one, each ring at a lower depth than the previous, with The Great Forge in the center at the lowest level. There are still some images of the layout and screenshots of the city floating about. 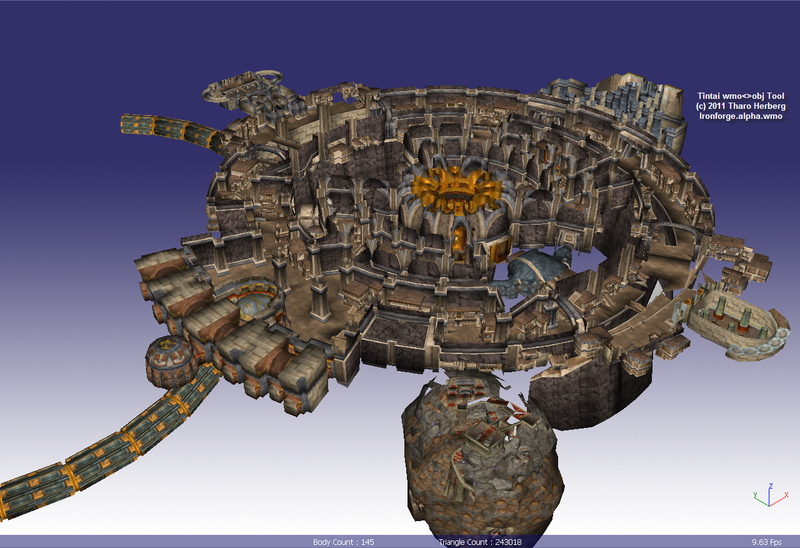 There were 3 layers of Ironforge in total if you include The Great Forge at the center. In a way, the layout sort of reminds me of Ba Sing Se. If Ironforge had stayed like this, it would've been one of, if not THE biggest faction hub in World of Warcraft. The MapID of Ironforge is 341. This is used for any WoW API function that requires a MapID. Ironforge is the capital city of the dwarves. It is am intricate circular cavern carved into the mountains of Dun Morogh, with a massive forge near flight paths at the center. It is primarily populated by dwarves, but there is a strong gnomish presence in Tinker Town, as well as humans traveling via the Deeprun Tram. It was quite popular for Alliance players in the past to idle on the bridge between the AH and the bank to show off their new gear. In 4.1, players were able to access Old Ironforge, a series of caverns below the city that featured a monument to the previous ruler, Magni Bronzebeard--now frozen in ice. The Commons: AH, bank, Inn, some vendors. The Mystic Ward: Portals, caster trainers. The Forlorn Cavern: warlock/rogue trainers, also fishing. Hall of Explorers: Ironforge Library and Museum, home of Explorer's League. Tinker Town: Gnomish district--engineering/alchemy trainers and access to Deeprun Tram. The Military Ward: Battlemasters, Hunter/Warrior trainers. 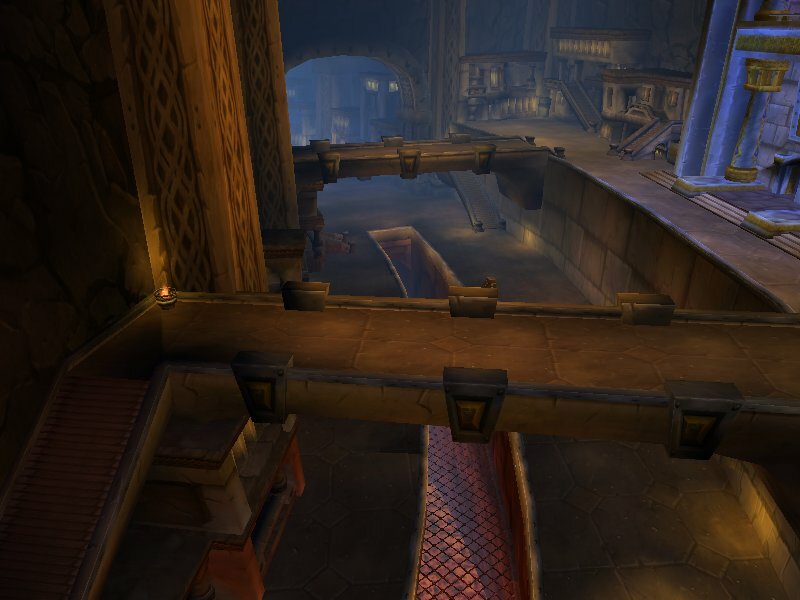 Old Ironforge: Series of stairways and tunnels leading to monument for Magni Bronzebeard. The Great Forge: Gryphon Master, access to Throne Room and Old Ironforge, many profession trainers set up shop along the edges. Ironforge is the ancient home of the dwarves. A marvel to the dwarves' skill at shaping rock and stone, Ironforge was constructed in the very heart of the mountains, an expansive underground city home to explorers, miners, and warriors. Before the Dark Iron Clan was banished from the city, eventually leading to the War of the Three Hammers, Ironforge was the commercial and social center of all the dwarven clans. Once dominated by the Bronzebeard Clan, the Dark Iron and Wildhammer clans have a strong presence in Cataclysm. Relatively recently, Ironforge also became home to the Gnomeregan refugees. After the Third War, the gnomish city of Gnomeregan became overrun by troggs. Since then, a number of gnomes have settled in Ironforge, converting an area of that city to their liking, an area now known as Tinker Town. In Cataclysm, Magni's estranged daughter Moira has returned, along with her infant son, the heir to the Dark Irons. She maintains a tenuous alliance with Muradin, the new Bronzebeard representative, and Falstad Wildhammer.